Although these criteria may seem obvious, for the spindle designer, they represent a wide array of needs that are quite difficult to meet and optimize, in one design. As we will discover, many of the criteria are contradictory to one another, and eventually, a compromise must be chosen to provide the best design. The machine tool, also, will present design constraints to the spindle. The amount of available space in the head, cost considerations, complexity and market demands will affect the ultimate spindle design. The cost will have a significant impact on the final spindle design. A very sophisticated and capable spindle design will not be acceptable on a low-cost machine tool. Consequently, an advanced machine tool design can justify the higher cost of a more capable and complex spindle package. In fact, a fast and accurate machine tool will demand a reliable high-speed spindle system. The first decision which must be made is if a belt-driven spindle or integral motor-spindle design will be required This must be determined by evaluating the requirements of the machine tool, including the maximum speed, power and stiffness required, Also, cost is an important factor, as a belt driven spindle generally is a lower cost solution than an integral motor-spindle. Power and rotation are supplied to this spindle by an external motor. The motor is mounted adjacent to the spindle, and the torque is transmitted to the spindle shaft by means of a cogged or V-belt. The power, torque and speed of the spindle will, therefore, depend upon the characteristics of the driving motor, and the belt ratio used between the motor and the spindle. Therefore, it is evident that a belt-driven high-speed spindle will be limited to certain applications. Typically, belt-driven spindles will be used up to a maximum rotational speed of 12,000 - 15, 000 RPM. To accomplish this, other means must be used to allow the higher speeds, including different bearings types, setups, or bearing lubrication. The integral motor-spindle does not rely upon an external motor to provide torque and power. The motor is included as an integral part of the spindle shaft and housing assembly. This allows the spindle to rotate at higher speeds as a complete unit, without the additional limitations of belts or gears. 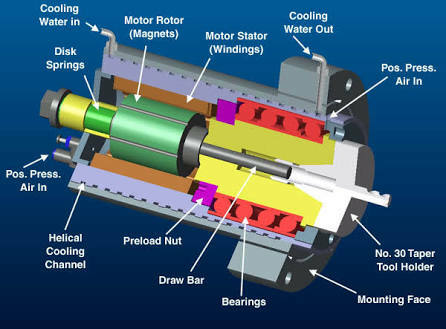 In general, a complete motor-spindle is comprised of the spindle shaft, including the motor element, and tool system. The spindle shaft is held in position by a set of high precision bearings. The bearings require a lubrication method, such as grease or oil. The spindle shaft then will rotate up to the maximum speed, and exhibit the power characteristics of the motor type that is used. The selection of a particular component will, of course, depend upon the requirements of the machine tool. Also, compromises must be made in order to provide the best combination of speed, power, stiffness and load capacity. One of the most critical components of any high-speed spindle design is the bearing system. Our design requirements state that the spindle must provide high rotational speed, transfer torque and power to the cutting tool, and be capable of reasonable loading and life. The bearing type used must be consistent with these demands, or the spindle will not perform. High precision bearings are available today from a variety of manufacturers worldwide. The type of bearings available for high-speed spindles includes roller, tapered roller and angular contact ball bearings. The selection criteria of which type to use will depend upon the spindle specifications, as each will have an impact or impact upon the bearing selection, as the following table explains. As you can see, there are many factors that determine the final decision. A spindle that is desired to have the highest speed will not have the maximum stiffness possible, and, the spindle with the highest stiffness cannot run at high speeds without sacrificing bearing life. So, as designers, compromises must be made in order to arrive at a final design that will offer the compromise. Bearing Lubrication is also a critical component in the complete high-speed spindle system. Depending upon bearing size, type, and speed, bearing lubrication may be permanent grease packed or some type of oil system. The maintenance of the lubrication system is vital and must be closely monitored to ensure that proper bearing conditions are maintained. Oil mist, oil jet, and pulsed oil-air systems require that clean, dry and continuous air be supplied. Also, use of the correct type, quantity, and cleanliness of lubricating oil is critical. Integral motor spindles must utilise an electric motor as part of the rotor shaft. Therefore, the motor size and capacity will depend strongly upon the available space. As we have discussed earlier, bearing size is critical in a high-speed spindle design so the motor shaft will affect the bearing size that can be used. The bearing size also affects the loading capability, stiffness, and maximum speed, so the motor characteristics must match the bearing capability. The most common type of motor used in high-speed motor spindles is an AC induction motor. In this design, the rotor is attached to the spindle shaft, either with an adhesive or thermal clamping. The rotor and stator, the winding in which the rotor revolves, are generally provided by a motor or drive supplier. The rotor is attached to the shaft during assembly. Following this, the bearings are mounted to the front and rear of the shaft, and the shaft is then fitted into the spindle housing. The spindle shaft is quite important, as it must transfer the power from the motor to the cutting tool. the shaft must locate and support the bearings, and contain the complete tooling system as well. One important design consideration for the shaft is bending. During high-speed operation, the shaft will exhibit bending characteristics. The frequency at which the shaft will bend depends on the diameter and length of the spindle shaft. It is often tempting to design a very long spindle shaft, as this increases the load carrying capacity of the spindle and allows for a more powerful motor. However, care must be taken as the spindle grows in length, the first bending mode will approach frequencies in the operating zone. This is not tolerable for spindle operation and must be resolved by either re-designing the shaft with a larger diameter (bearings will be larger and slower!) or decreasing the shaft length. The spindle shaft and motor must be held in a housing. The housing may be an integral part of the machine tool, or it may be a cartridge housing. Many high-speed spindle designs utilize a cartridge type housing, as this is the simplest to service, and the tolerances required for high speed are easier to obtain when the housing can be produced as a cylinder. The primary function of a spindle housing is to locate the bearings. High precision bearings, being run at top dN values, must be located exactly in terms of geometry and size. In addition, the housing will provide the lubrication, air seal, cooling water or oil, and other utilities required by the spindle. If the spindle utilizes oil lubrication, the housing will include drilled passages to deliver the oil or oil mist to each bearing, and out of the bearing to a return line. A cooling liquid is often used to remove heat produced by the spindle motor stator, as this heat would affect the size and accuracy of the spindle as a complete unit. The spindle housing is typically connected to the machine tool by means of a flange or attaching bracket. Care should be taken when handling any precision spindle. Crashes, dents, and other damage can affect the accuracy and bearing life. A high-speed spindle design must take into consideration the desired end result: the required power, speed, torque, tooling system used, accuracy, and life. From this design specification, the needed components can be selected including bearings, shaft design, motor, lubrication system, tooling style, drawbar system, housing and cooling system. As we have seen, bearings will impact a spindle design to the greatest degree. High-speed spindle designs most often run bearings systems up to the limit, in order to be the most productive. And, as integral motors are limited in maximum torque available, higher speeds will yield higher power. To reach these speeds, and maintain a reasonable life, precision bearings must be used, along with complex bearing lubrication systems. Oil jet or mist systems not only boost the speed of the bearings, they also provide cooling and cleaning functions as well. Maintenance is critical to the performance of precision bearing systems. Positive over-pressure and labyrinth air seals also should be used to protect the bearing environment. In addition to the bearings, the spindle shaft design must be capable of providing a strong motor, suitable tooling retention system, and stiffness without developing bending problems. And, all rotating components must operate in a balanced condition. The spindle housing must support and locate the bearings accurately, and provide the utilities needed by the spindle system. It must be robust and stiff, as the housing transfers all forces from the spindle to the machine tool. In general, a high-speed spindle design will be the result of many compromises. Bearing size and type will dictate maximum speeds possible. Increasing pre-loads and additional tandem bearings will increase stiffness, but speed will be sacrificed High power motors will not fit into the design envelope, and more complex drive systems are required. Higher speeds require higher precision tooling systems, better balance, and cleanliness to obtain the desired results. P.S: I couldn.t find any design calculations so, you will have to compromise with this only.